In France today, the insurers who wish to develop a PAYD offer for individuals don’t have much choice : they are required to use aggregate data to comply with the recommendations of the CNIL. The first consists of downloading a stream of data onto a computer server and aggregating all this information on that same server. The second method consists of completing the aggregation of data directly in the electronic unit and downloading only the statistical results onto a computer server. While at first glance these two methods produce the same final result, they present certain differences at the legal and technological level. This first method is the one put into practice by most PAYD systems in Europe. In France, certain insurers would have obtained the approval of the CNIL to return data on global position alone (momentarily setting aside data relating to speed) under the condition that the data is first aggregated by an escrow service (confidential third-party). But for many motorists, escrow or not, from the moment their personal data leaves the vehicle, they feel their privacy is no longer protected. Many others asked "why bother sending the raw data outside the vehicle if in the end the insurance companies are only going to use the statistical indicators ?" Is it possible to aggregate the data directly inside the onboard unit ? The answer is yes, but a geographical road map database must be integrated into the unit in order to match each position to a given type of road. 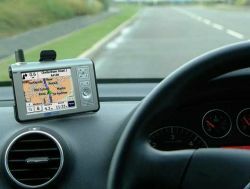 It is true that this last point could constitute an inconvenience compared to the previous solution (even though today all GPS navigators include a road map database), however it also offers the advantage of being able to calculate statistics on speed and take into account road conditions without any raw data leaving the device. Besides dispensing with the need for an escrow, this method also provides a significant financial benefit. Since the only data to leave the vehicle is statistical, it can easily be transferred from the unit through text messaging (SMS), which is a big savings compared to the prior solution.